Ten days after street protests in Bangkok escalated into violence that killed five people and injured many, Thailand’s democracy hangs in the balance. Facing revived mass demonstrations by ‘yellow-shirt’ opponents in Bangkok following a brief truce, Prime Minister Yingluck Shinawatra’s government has responded by dissolving parliament and calling a general election, scheduled for 2 February. However, the demagogic protest leader, former deputy prime minister, Suthep Thaugsuban, has called for an unelected People’s Council to take the place of Yingluck’s caretaker government, for Yingluck’s arrest, and for the army to guard public buildings. In November, demonstrations against Yingluck’s administration escalated as Suthep’s yellow-shirt protesters occupied government ministries. The immediate stimulus was the government’s use of its parliamentary majority to attempt to ram through legislation that would pardon Yingluck’s brother, former PM Thaksin Shinawatra, allowing him to return to Thailand from exile, avoid trial for corruption and abuse of power, and reclaim sequestered assets. Another proposed new law provided for a fully-elected Senate. The Constitutional Court rejected the new laws, but the government said it would re-present them to parliament early in 2014. The protests then quickly evolved into a concerted effort to unseat the government, which had won the July 2011 elections with 265 seats against the Democrats 159. Since 2001, when his Thai Rak Thai party first swept to power, Thaksin’s populist approach has radically changed Thailand’s politics. 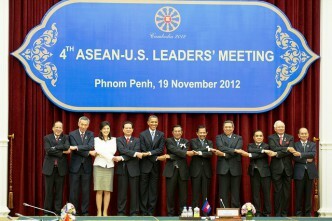 The success of ‘Thaksinism’ springs from politically mobilising the poor in Thailand’s disadvantaged but populous northeast and north, to which Thaksin’s governments have brought tangible socio-economic benefits through poverty-reduction projects, universal healthcare, and a price-support scheme for rice-farmers. Many urban working-class people also support Thaksin. From the viewpoint of his opponents, concentrated in Bangkok and central Thailand, Thaksin has corruptly used massive business resources to subvert democracy, intending to establish himself as a dictator. Suthep and others also highlight the government’s major policy shortcomings. Thaksin’s political success has provoked concerted opposition from conservative politicians and judges and from the middle-class, resulting in protracted political turbulence. 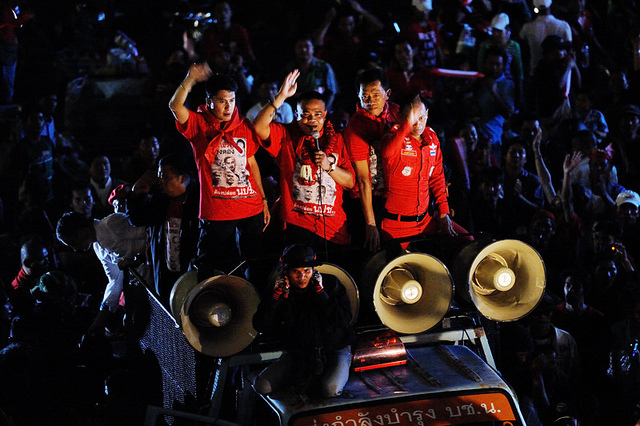 After what amounted to a judicial coup brought down a previous government backed by Thaksin and installed one under the Democrat Party leader, Abhisit Vejjajiva, demonstrations by pro-Thaksin red-shirt protestors in early 2010 culminated in open conflict with the army in Bangkok. Society has become increasingly polarised, Thais aligning themselves with pro-Thaksin red or anti-Thaksin yellow factions. Meanwhile, the mass media have often adopted virulently partisan positions. Thailand’s current politics have much in common with those in other developing countries, where the shift of political power towards the rural and working-class masses as a result of political liberalisation has dampened middle-class enthusiasm for democracy. Suthep’s political doctrine is certainly essentially anti-democratic; indeed many observers have referred to it as fascist. However, there are also important special factors in Thailand, where some claim that political tensions are entwined with manoeuvring between rival factions in the power structure in advance of an inevitable monarchical succession. Yingluck’s government has been concerned to avoid violence, which would play into the protesters’ hand, perhaps justifying a coup. So far, the government’s red-shirt supporters have largely avoided direct confrontation with protesters, and the government didn’t deploy police to prevent the invasion of government ministries. But over the weekend of 30 November–1 December, lethal fighting broke out between yellow-shirt students and red-shirts. On Monday, Suthep’s mob launched assaults on Government House and the Metropolitan Police headquarters. The government then deployed police in strength to defend key locations. However, the police restricted themselves to using tear-gas and rubber bullets against the protesters, none of whom was killed. Senior officers have repeatedly said that the armed forces wish to avoid taking sides. There are important reasons for the military to avoid direct intervention. Many soldiers are recruited in the same areas where support for Thaksin is strong and are sympathetic to the red-shirts: a coup might split the military. Moreover, the armed forces might be treated no better under a new, unelected administration than under Yingluck, who has provided lavish defence budgets. Nevertheless, army commander General Prayuth Chan-Ocha ordered unarmed army medical personnel to administer first-aid to injured protestors. The army medics’ presence constituted another reason for the police to act with restraint. But the armed forces’ main role in the current crisis has been to mediate. After a meeting between the PM, Suthep and military commanders led by General Prayuth on 2 December, over the following days the government allowed protesters to occupy sites that the police had previously defended vigorously. The present crisis is far from over. Suthep and his followers transparently seek to eliminate Thaksin and his allies from politics. Yingluck’s announcement on 9 December of a parliamentary dissolution, followed by elections, hasn’t satisfied the protesters, who call for an unelected People’s Council to govern Thailand. A general election would be held only after fundamental reforms, including a ‘vote-buying free election system’ and thoroughgoing overhaul of the supposedly pro-Thaksin police force. In the meantime, Suthep has called for civil servants to report to his People’s Democratic Reform Committee, and for ‘people’s forces’ to replace the police. Elections since 2001 have repeatedly demonstrated the huge appeal of Thaksin’s populism and the Democrats’ relative weakness: pro-Thaksin forces would be extremely likely to win any near-term election. Consequently, the opposition may boycott the forthcoming poll in order to deny its legitimacy. Suthep’s proposed People’s Council, an unelected corporatist regime, would be completely unacceptable to the red-shirts, who would presumably mobilise en masse against it. There’s no obvious way out of Thailand’s present political predicament. There seems little likelihood of decisive intervention by the monarch, or in the immediate future by the army, and there are good reasons to think major unrest will continue, and even to fear more serious civil strife.